With this trio of Shakespeare-inspired compositions Venezuelan boy wonder Gustavo Dudamel and the Simón Bolívar Symphony Orchestra (the former “Youth” Orchestra has officially grown up) sign their second Tchaikovsky disc for Deutsche Grammophon. Unfortunately it is about as uneven and doubtful as the first (which paired “Francesca da Rimini” with Symphony #5). While the energy and enthusiasm at making music of this ensemble is certainly praiseworthy and may indeed serve as an example to many of the top orchestras, what is still missing here is an overall concept as much as a specific sound which could have pulled these pieces out of the unjustified category of mere sonic spectaculars. It’s not that Dudamel lacks imagination, yet judging by this recording from February 2010 he is as yet unable to frame his ideas and present them into a convincing whole, while his phrasing and tempi changes tend to sound contrived rather than spontaneous. 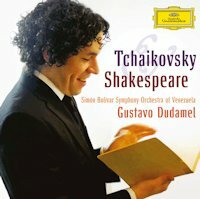 Categories: CD reviews | Tags: Deutsche Grammophon, Gustavo Dudamel, Hamlet, Pyotr Ilyitch Tchaikovsky, Romeo and Juiet, Simón Bolívar Symphony Orchestra of Venezuela, Tchaikovsky, The Tempest, William Shakespeare | Permalink.